Powers/Abilities: Can manifest anywhere in the world, so long as there is smoke for him to emerge from. Able to fly. Able to generate intense cold and ice. Immortal. History: "I am Aarkus, Destroyer of Evil. I've crossed the great cold into your world. I Am Here!" (Marvel Mystery Comics #13-48, Kid Comics #3, ga) Dr.Enoch Mason was a respected scientist who theorised that smoke was a catalyst that linked Earth's dimension with a supernatural one. To test this he developed a device he dubbed the dimension smasher, using money borrowed from the mobster "Brains" Borelli. In the middle of his experiment, Brains came to collect, and when the scientist couldn't pay, the mobster's thugs threatened to kill him. They were interrupted in this villainous endeavour by a being who emerged from the smoke coming from one crook's cigar: Aarkus, Destroyer of Evil had arrived. Aarkus, dubbed the "Vision" by the humans, was a law enforcer from "the Smoke World", his home dimension, and he made short work of Brains and his men. He would continue to come to Earth to battle evil for some time thereafter. (Marvels #1) Aarkus joined a number of other superhumans in an airdrop on a Nazi stronghold. (Invaders II #3-4) Having been drawn to Earth by Dr.Death of the Battle-Axis, Aarkus was forced to work alongside them under threat of being trapped forever on Earth, fighting against the heroic Invaders. However in the climactic battle between the Battle-Axis and the Invaders, Dr.Death's version of Dr.Mason's machine was destroyed, generating enough smoke to allow Aarkus a route home. To redeem himself somewhat, when he departed, he took with him poison gas which the villains had pumped into the room to kill the Invaders. Comments: Created by Joe Simon and Jack Kirby. As well as the origin given above, the Vision was given two other origins. 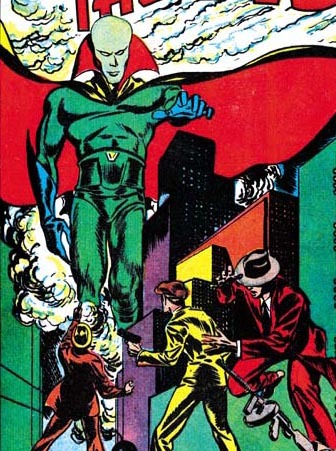 In Marvel Mystery Comics #23, it was explained that the Vision had captured the first criminal to commit murder on the Smoke World in centuries, and was looking for a place to banish him when he made contact with scientist Markham Erickson (not Enoch Mason), an Earthman who had breached the barriers between the two dimensions. Erickson asked Aarkus to travel to Earth and guard humanity, which agreed to do, first dropping the killer off on Jupiter. This origin could probably be amalgamated with his original one, without too much bending out of shape (scientist names not withstanding). However, in Marvel Mystery Comics #45 the Vision fought Japanese agents who had travelled to Shangri-La in search of the secret of immortality, and he informed them that he had been "the first High Lama" of the place, who had obtained immortality and then vowed to use his prolonged life to defend mankind. Either Aarkus was lying (they were enemy agents, after all), or perhaps the immortal High Lama then made his home in the Smoke World as he became less human. The Vision's first modern era appearance was in Avengers I #97, when Rick Jones psionically created images of a number of wartime heroes, including Aarkus. He was also seen in one of the Earth X spin-offs, 4 #1. However I haven't counted either of these in his history above.